Your Superbowl Pep Talk for Love! In honor of the upcoming Superbowl, I was watching this funny video featuring the best pep talks from sports movies, and I couldn’t help but think how spot-on the advice is for love, too. If you need the confidence this weekend to get out there in love and absolutely kill it on the dating field the way the Superbowl teams will be killing it on the playing field, this is it. As my favorite part of the edit says: “Everything y’all done to this point…means nothing if you lose yourself.” And that is so incredibly true about dating, isn’t it? Finding a great relationship isn’t about changing yourself to be who someone wants. It’s about being true to yourself and attracting the right person for just who you are. Don’t lose you. What Makes You Say: “I Love Me Some Me”? Do you love you some you? Because to have a healthy relationship, it’s vital you do. If you want to be loved for who you are, you have to know why you love who you are. That was the theme behind last week’s “Book and a Bikini” contest, for which we have our winner! We want to congratulate Debbi F, whose name was selected in a random drawing yesterday. She loves “living by the ocean…it is incredibly beautiful during gorgeous weather, but also during coastal storms.” And now she can now love reading her paperback copy of Meeting Your Half-Orange and wearing her Kushcush Milla Bikini! I love my ability to make others around me laugh and feel comfortable in many situations. I love my teeth…and the smile that sits in front of them! I love my independence! I spent so much time growing up being worried about everyone else and their perception of me. But now, I feel like I can have my own opinions and voice them. I love my nose. I used to hate it, its my dad’s nose, big and straight and strong, and I wanted a cute little ski jump nose like all the other girls. Now I think its perfect for my face and it distinguishes me from others. I’ve learned once you embrace something in your life, you begin to appreciate it more. I love my creativity, especially my ability to cook and play guitar. I love the fact that at the age of 40 I’m in my final semester of college! I love love my feet! I think they are the cutest part of my body. 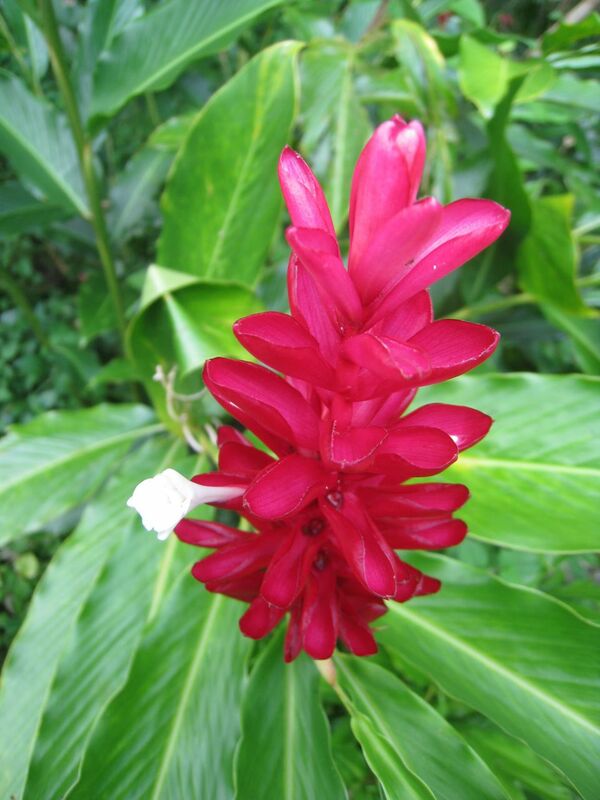 I love that I have finally learned to “let go” and ALLOW wonderful people, events, things to come to me. I love my ability to see past people’s flaws and recognize the good person that usually lies within them. What I “love” most about myself is my ability to randomly wish people a good day when I go about my work or errands. I love my quirky personality and ability to stay positive. I love how much people underestimate me. It always feels good to to better or nicer or more-hardworking, etc. than someone expected. I LOVE THE WOMAN I HAVE BECOME!! For so long I was overly critical of myself, always thinking that someday I would be the woman I had promised myself I’d become inside and out. Recently I woke up and realized that “someday” had arrived!! I Love my Teeth, Smile and Friendly Personality!! I Love Me Some Me!! There. Did that give you some ideas for reasons you should be loving you? Once you know what makes you a wonderful, lovable catch, other people will start to see that in you and want to be a part of your life. You know, like in that scene in When Harry Met Sally: “I’ll have what she’s having.” Think about what makes you say, as our last commenter did, “I Love Me Some Me!” And then, oh, they’ll love you. 10 Things Singles Should STOP Saying…and What to Say Instead! 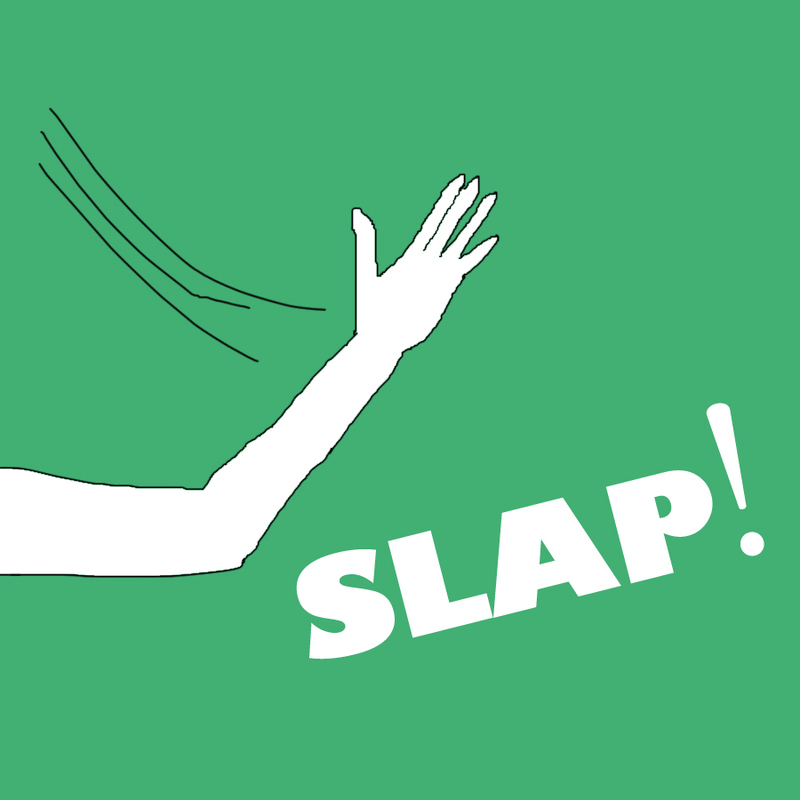 Now, I’m not as into slapping as the girls on Jersey Shore seem to be. But every now and then I hear something from a single person that makes me wonder, “Now, what it would take to stop you saying that?” Because sometimes, what you say about your single life hurts you more than a slap even could. So, I’ve come up with a list of the Top 10 Things I Think You Should STOP Saying When You’re Single. And here’s what I want you to know about these things: I’ve said them all. Yep, every darn one. In fact, the only reason I know about these phrases and the exhausted frustration with which you might cough them up is that they came out the same way from me. So if you recognize your own voice saying any of these things, you have to change your story. Why? Because while it may feel good to say some stuff out loud, the more you say it, the more you’ll believe it, the more you’ll create the energy of it around you, and the further you’ll it’ll send you from the love of your life. Here’s my list. What’s on yours? So that’s my list. Admit it: Which of these things have you caught yourself saying? And what have you heard or said that should be on the list? 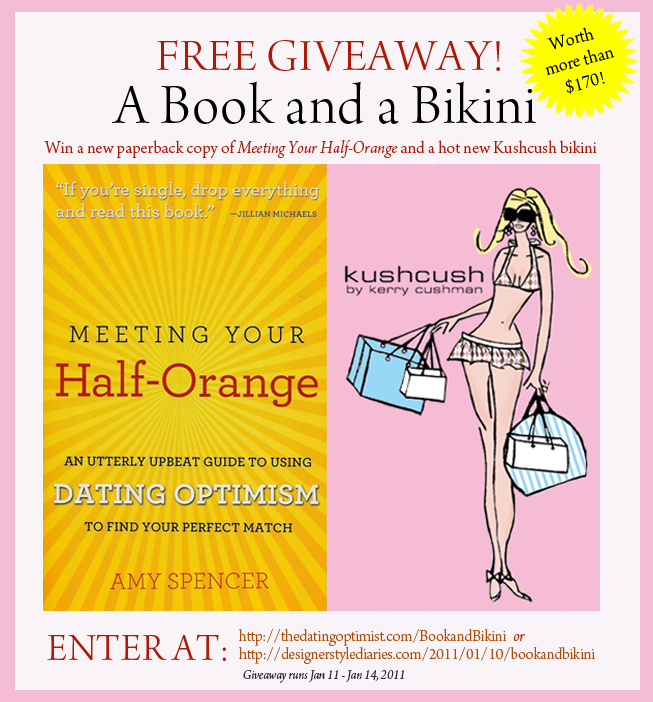 This Contest Is Over: WIN A Book and a Bikini: A Copy of Meeting Your Half-Orange and a Kushcush Bikini! Note: This contest has been completed. But check out the book and bikini anyway, as they make for a perfect summer love package. Who’s ready for a dose of sunshine? To celebrate the new paperback for Meeting Your Half-Orange: An Utterly Upbeat Guide to Using Dating Optimism to Find Your Perfect Match, I’m doing a giveaway: Win a brand new paperback of Meeting Your Half-Orange and a fabulous Kushcush “Milla” bikini to wear on your winter beach vacation while you read it! What a perfect way to attract your other half. Kushcush is a Los Angeles-based company founded by designer Kerry Cushman (see the whole gorgeous line here and read her posts at Designer Style Diaries). Kushcush suits have been featured in W, In Style, OK!, Marie Claire, WWD and on the E! network and the new Sports Illustrated Swimsuit book Heaven and have been worn by Kim Kardashian, Jessica Biel, Nicole Ritchie, Audrina Partridge, Nicky Hilton and others. And if you win the giveaway, it will also be worn by you! This “Milla” style is part of the as-yet-unavailable Spring 2011 line and flattering on absolutely every body—so good, the style made the Us Weekly Buzz-o-Meter because they thought so, too. If you don’t have a beach trip planned yet, well, what better way to look forward to one than with a hot new bikini (hello, healthy body inspiration) and an optimistic book to read on the sand, right? The way I see it, “A Book and a Bikini” is the perfect formula for feeling fab about yourself as you set off toward meeting your half-orange. Contest runs from Tuesday, January 11th to Friday January 14th at 12 midnight. To Enter: Comment below with one thing you “love” about yourself or your life—Meeting Your Half-Orange is about optimism, after all! Maybe you love your friends. Or your job. Or your laugh. Or your photographs. Or your feet. Or, uh, maybe you love your taste in bikinis and dating books. That’s it. Just tell us what you love in the comment box below and you’ll be entered to win! Note: Contest is only open to residents of the U.S. and Canada. One entry per person. 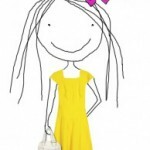 We’ll choose a winner from comments on TheDatingOptimist.com and DesignerStyleDiaries.com in a random drawing. Be sure you’re using a working email with your comment, as we’ll be notifying you via email after January 15th if you’ve won to get your address and bikini size. Big love and best of luck. Every Kushcush bikini reads “Love Your Bikini ” on the tag. Now it’s your turn…tell us what you love! “How do you know if someone is really your half-orange and how soon can you tell?” —R. Ask your gut, which I like to think of it as asking if your two major systems see a “Go.” Your gut is like a perfect blend of your emotional half and your logical half. If your emotional half is gung-ho about it, you can check in with your logical half and look at it from that point of view: Is he a good fit for you? Will he keep you safe and look out for your best interests and allow you to be your best self, and be a good partner as you go forward? Do his morals and his drive and plans for life match up with yours? If your heart is in, now is the time to step back and see if your brain agrees. It may find little things that don’t matter (“I pictured a guy who wore better shoes”), but if it finds things that are more serious (“Hmm, he talks an awful lot about stealing from his friends”) it’s worth a serious debate. You can know someone is your half-orange pretty quickly. Or, it can take a minute to realize a gem you have in front of you. There is no hard, fast rule on timing. Your gut will know. Ask it.